What’s that, you say? Well, it’s only the best sweet shop in Paris, owned, managed and run by Ms Denise Acabo. Here’s a picture of the great lady together with me and Mr. Manx, who was reflected in the mirror. 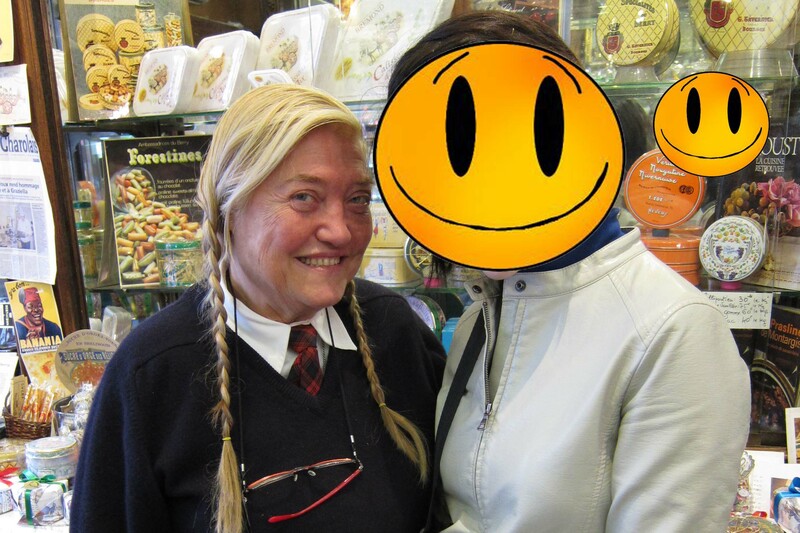 In case you’re not sure, Ms Acabo is the one with the blonde braids. 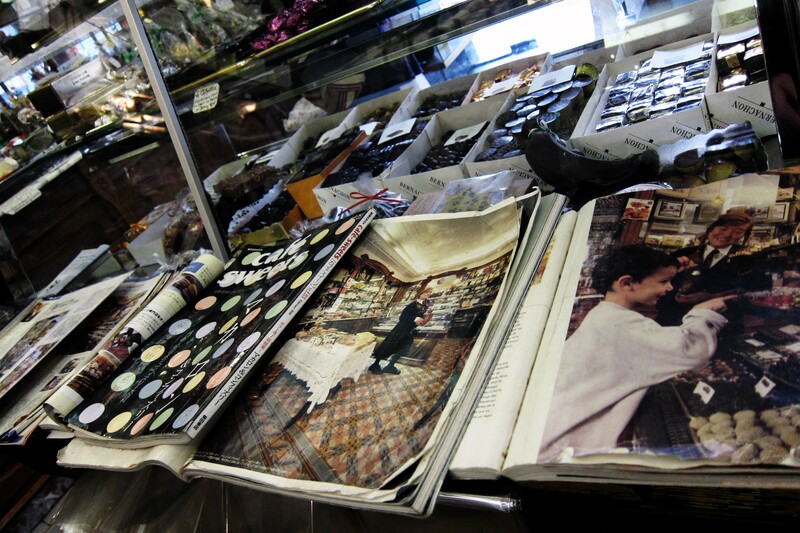 We didn’t have long to spend there, so most of our time was spent choosing nougat bars, chocolate almonds and sugared pecans as souvenirs for our friends. But as a treat for myself, I bought a Bernachon chocolate bar – Kalouga, since I am in a caramel mode these days – which I haven’t eaten yet and am saving for either a very good or a very bad day. Christmas ought to qualify. Mr. Manx took a picture of some old periodicals on display. I swear, neither Ms Acabo nor her shop have changed. At all. 1) Ms Acabo has been running this shop for about forty years (!) and is over seventy years old (!!!). 2) It doesn’t matter what language you speak. Once she sees your eyes light up, she will give you a tour of the treasures in her shop in French, and somehow, you will feel that you understand. 3) She uses a special wrapping paper with those illusion pictures – you know, the ones that should be turned upside down or have a hidden face somewhere. 4) She’s pretty big in Japan (hur hur, Alphaville fans). She’s appeared in Japanese magazines and, indeed, there was a Japanese tourist who popped in to buy sweets and take a picture with her. 5) Pistachio and dark nougat bars are far better than plain. 7) Under no circumstances whatsoever will the combination of chocolate and peanuts be tolerated on these premises. Ever. 8) Ms Acabo believes in gentlemen. After I had made payment, she wouldn’t let me near the bag and instead held it out to Mr. Manx, and I caught the words “l’homme” and “portez“. Wahaha! I think it’s fantastic that someone has invested this much passion into a sweet shop. This is sort of place that will stay the same over time and will never franchise. I do hope I get to come back to it one day. A L’Etoile D’Or is at 30 Rue Fontaine, 75009 Paris, quite near Moulin Rouge. No website either, but lot of reviews if you Google it. Spring and autumn are my favourite times to visit a place, because it’s cool without being frigid and there won’t be a rowdy summer crowd. I’ve been to Australia, Taiwan and Japan during these seasons and have been so envious of their weather then. Well, on Saturday night, Mr. Manx and I are flying off to Paris and England! I cannot wait to be there. I was there once before as a kid. My parents took Wedoryn and I on a package tour before spending some time in England, where they went to university. In the strange way that childhood memories have, the brightest recollections are of the least obvious moments. I do remember Disneyland, but with nothing of the vibrance of Trafalgar Square, where I had a whale of a time hiding handfuls of birdseed in a five-year-old Wedoryn’s cap and sweater, then watching him get obliterated by a frantic cloud of pigeons (there are no more pigeons there now, but that’s how I want to remember it). I remember thinking that Sacher Torte was no big deal (‘cos it was dry and I didn’t like cream) (sorry, Austria) and crazily worrying at one point that we were running out of money because my dad told me that English money was worth much more than Singaporean (I was also thinking that this was not fair; my twelve-year-old self had no grasp of economics; not that I have any now). Mr. Manx has never been, so this will be his first chance to get some authentic European memories. Well, OK, no, I don’t want Ms. Olsen Twin ‘cos I prefer dudes have Mr. Manx (this is the primary reason, non?) and it’s not even exactly her bag I’m lusting after, but these pictures show the best approximation I could find. What I want is a Chanel reissue (therefore with the Mademoiselle instead of the CC lock on Ms. OT’s bag) in distressed red (darker and more veined than Ms. OT’s bag) and silver hardware (completely different from Ms. OT’s bag), size large (similar to Ms. OT’s bag). If I find it and get it, I would certainly wear it with a black dress or with neutral-top-and-jeans like Ms. OT in the first two pictures, but definitely not with evening wear. Maybe it’s just my funny eye, but I’ve never fancied Chanel classic flaps as evening bags. Expensive, luxurious and beautifully-made though they are, to me they lack the frivolity? whimsy? essential uselessness? of a real evening bag. It probably has something to do with the combination of boxy shape and shoulder strap. Besides, if one carries a Chanel classic flap to a posh event, one runs the very real risk of meeting five other women in the room with the same idea – tres bummer. Now, if one, on the other hand, carries a non-black, functional-sized Chanel classic flap in the daytime, one stands a much better chance of being quite unique. I finally made it to an optician to choose a new pair of spectacles this morning. Feeling in a bit of an atas mood, I became today’s first customer at Integrated Eyecare Centre in Vivocity. My main motive, really, was to check out the featherweight Swissflex frames, because anything remotely heavy turns my skin a noxiously bright cherry red at the pressure points. But even though I did pick out three Swissflex frames with geeky-cool vibes (note to self: full-frame green, cream and amethyst good; light pink and peach very bad with my sort of colouring), I found that they sat a tad too close to the eyes for comfort. After going through a couple dozen more frames from Gucci (meh), DKNY (meh), Lafont (French, boudoir-funky, metal lace and rich colours, but heavy), Police (angular industrial-cool, but bigger than I’d like), and Parasite (completely futuristic with four legs, would have looked right at home in the Matrix trilogy, imagine what the examiners would think if I took my specialist exams wearing those), my heart was moved by a little beauty in two of my favourite colours – wine and cream – in a lightweight, flexible structure that I’d never seen before. I won’t attempt to describe it because I wouldn’t do it justice, but I will do a reveal when I get it sometime next week. But my absolute favourite part of the process was when I’d just finished testing my eyes, and the optician told me that my degree had gone down. I was like, no kidding, because my degree has blissfully gone up every. Single. Bloody. Time. I have had my eyes tested in my life, leading to deep chagrin at each encounter. So much so that, in the spirit of enthusiastic denial, I’ve stubbornly maintained my contact lens prescription at 550 degrees per eye, even though at the time, that would have just suited my right eye and undercompensated my left by maybe 50 degrees. The rimless pair that just broke went even higher than that, and so I was confidently expecting both eyes to have landed solidly in the 600 – 700 range. But today’s results: right eye 425, left eye 500. Some astigmatism, but not absolutely horrible. So yayness! I’m not going blind. There. At least one rock-solid reason why my old glasses broke – they weren’t good for me anymore, and indeed I had been having more headaches than usual in the past few months. My hypothesis that everything happens for a reason has gained more evidence. But it does look like I’ll need to give my eyes some time to stabilize before seriously thinking about Lasik. That’s OK. All the better for building my Lasik fund. Let me be absolutely frivolous today and talk about a new bag brand that’s caught my eye (this happens quite a lot when I’m on call. Yes, I am blaming my addiction on the work system). It’s called Hobo International, a company started by a lady named Toni Ray who should be in her seventies now. She came from a poor family, got abandoned by her husband when she was pregnant, then got fired from her bag-and-shoe-making job when she was fifty. So she turned to the only thing she knew, which was making leather bags. The thing I really like about her leather bags are their pockets. These things have veritable arsenals of secret pockets tucked into their little bodies. The best examples are the clutches. I TOTALLY see these two beauties in my near future – perhaps not in these colours, but definitely the architecture. 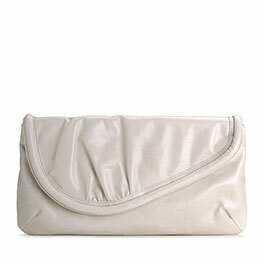 This is the Lori clutch in White Vintage leather. At 13.5 inches across, 7 inches high, and 1 inch deep, it’s quite a whopper, which I consider an essential criterion for a daytime clutch (there’s still an aching corner in my heart for you, Lauren Merkin Tatum). That asymmetric curve speaks of cool confidence that doesn’t need to shout to be heard. It also reminds me of the Dior saddle bags. The real abracadabra, though, lies in the inside. The clutch contains a paisley lining that boasts not just a zip and a slide pocket, but also eight credit card slots. I cannot begin to express how absolutely brilliant I think that is. I could leave my entire wallet (or wallets, since I carry two) at home and yet be able to find my plastic in two seconds. How could it be that this is the first clutch I’ve seen with this superb idea? And it doesn’t cost the earth either. Current sale price is US$118.80, down from US$190, which makes it about S$166 now. This is not a lipstick holder. 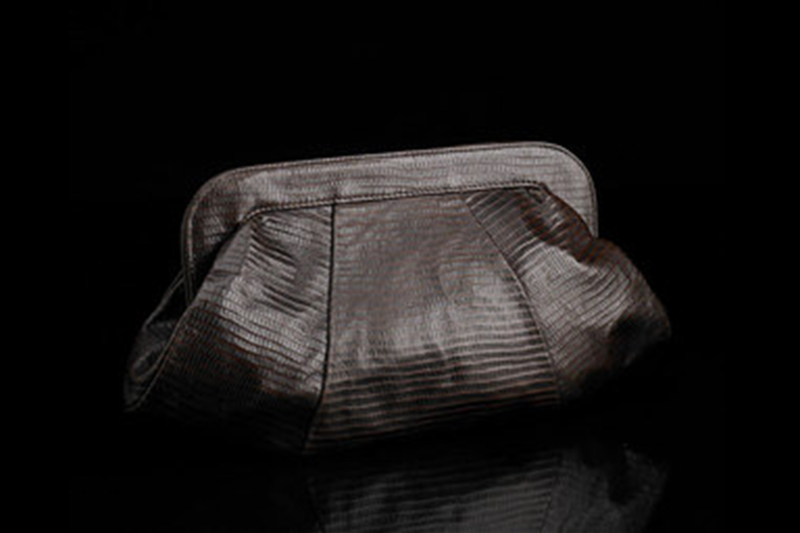 This is the Eden clutch in Shadow Patent leather. It’s smaller than the Lori at <11 inches across, 4.5 inches high and 1 inch deep, but it’s no midget either. There’s even a handle at the back to grab on to. Little Miss Perfect, you say? Complete with petticoated polka-dot skirt and high backcombed ponytail? With a ribbon? Well, exactly! 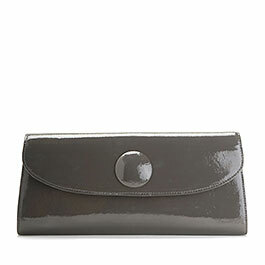 I think it’s cool the way this clutch conveys all that just by being plain and boxy, with a big button. It’s so 60s, it would be mind-blowing with a contemporary outfit. As for the inside, in addition to the zip and slide pockets and the credit card wall, there’s also a centre divider with a second zip pocket and a tiny removable change purse. Not kidding. It’s that adorable. It’s on sale now for US$76.80, down from US$128, which converts to about S$108. Drool-worthy? I certainly think so. If you like, here’s the link to Hobo International, so you can see what rocks your boat. There is actually a bag called Katie, but, alas, she does nothing for me. Addendum: the sale was announced yesterday and closes on 8th Jan 2010, their time. That makes it roughly our Friday afternoon. It was serendipity to have stumbled onto this site today. It was definitely meant to be. I’m not gonna wait on Rue La La’s sale to start just when HI’s ends. I’m buying now! After nine blissful hours of sleep (Friday night feels so good after two calls and before a free weekend! ), I woke up to check my email and was most excited to find that my Rebecca Minkoff Nikki Hobo had arrived at Viaddress and that it has already been picked up by Fedex. 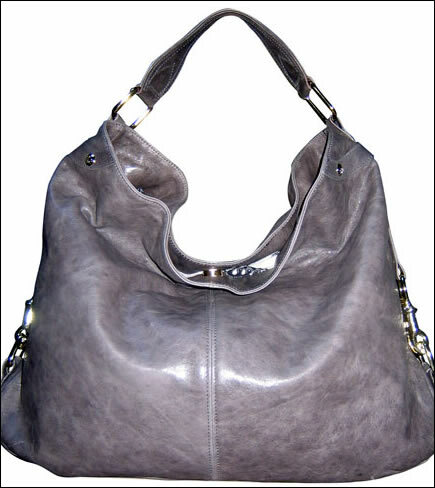 This is a Rebecca Minkoff Nikki Hobo in Cloud Grey; mine is in Jam Purple. Making something in Jam Purple is a surefire way of getting me interested in it. And it’s slated to arrive on Christmas Eve at about six in the evening. Merry Christmas to me, hohoho! One of the drawbacks of online shopping is when you see something you like and click ‘Add To Cart’, and after you’ve painstakingly typed in your name, address and credit card number, they tell you that they’re sorry, but “this item can only be shipped to destinations within the United States”. Then comes the time for choice expletives. Worse, this usually serves to increase your desire for the unattainable object. Familiar, yes? This happened to me over this clutch below. That’s a Lauren Merkin Tatum clutch, in dark brown serpent-embossed lambskin, which I found on the Gilt Groupe site, but GG is another story for another day. Thanks to Chanel, I find that the word ‘lambskin’ now oozes buttery-soft, supple decadence, about on par on the swank scale with ‘foie gras entier’ or ‘Godiva couverture’. And Lauren Merkin – that’s a brand that makes bags and accessories. I’m very drawn to it because it uses rich and sometimes unexpected materials to create bags in clean, simple and classic styles. In addition to the usual lizard and croc prints, there are also metallic and woven leathers, in gridded, tiled or marbled patterns, as well as fabrics like silk, crochet and even raffia. Every girl needs a timeless and match-everything baggie that she’d proudly wear to leisurely lunches and weekend high teas, non? So of course this had to be one of those sites that do not deliver outside the US. Not only that, they do not even accept credit cards with billing addresses outside the US. Grrr. Enter Borderlinx, which is just the thing to combat this problem. This is a site that gives you a US, as well as a UK, shipping address, so that your favourite ang moh sites will have an address that they can send your stuff to. Then Borderlinx DHLs your purchases back to Singapore. Registration is free, and they charge only if and when you actually use their services. Furthermore, Borderlinx has a concierge service that acts as middleman if your card doesn’t have a US/UK billing address. You just leave details of the site and your object of desire, and they will process it for you. There are caveats: first and foremost, only Citibank card members get to register on Borderlinx. Secondly, the concierge service only operates during office hours, so there is a chance that the apple of your eye might still slip away. Still, that’s better than nothing, eh? So, in the new Home Of The Manx style of bold bag-related adventures, I have actually placed an order with the Borderlinx concierge services for this Lauren Merkin Tatum clutch. I have no idea if it will come to fruition, because the sale started on the weekend, and I am crossing my fingers that Borderlinx gets there before the last piece runs out. It doesn’t help that the time difference between there and here makes things pretty much the other way around. Brrr. Hear ye, hear ye – Kate Spade is having a sale now. I found out when I was at Takashimaya yesterday. Not on new arrivals (like the Tutti Fruitti, Gold Coast and Hanover series), of course, but some of the offerings are pretty good. For example, the Boerum Hill Brennan I was eyeing was originally well over S$500 (I think it was S$560); it’s now about S$390 (I have to resort to approximations because I have a mind like a sieve). Unfortunately, the colour I wanted (Dijon, in case anyone’s interested) was already at the last-piece-and-it’s-on-display stage, and it was pretty beat-up. If anyone’s going to beat up my bag, it’s gonna be me. Other pieces I saw on sale included the Islington series, the Lincoln Road series and the Roland Park Kirks. I am unspeakably glad that I have managed to refrain from ordering the Brennan online for now. Maybe I will head to the Raffles City outlet on my Wednesday half-day to see if it’s meant to be mine. Mwahahaha.